Bengaluru : Newlyweds Deepika Padukone and Ranveer Singh on Tuesday treated fans to a few glimpses of their wedding celebrations, which was held at the picturesque Lake Como in Italy last week. 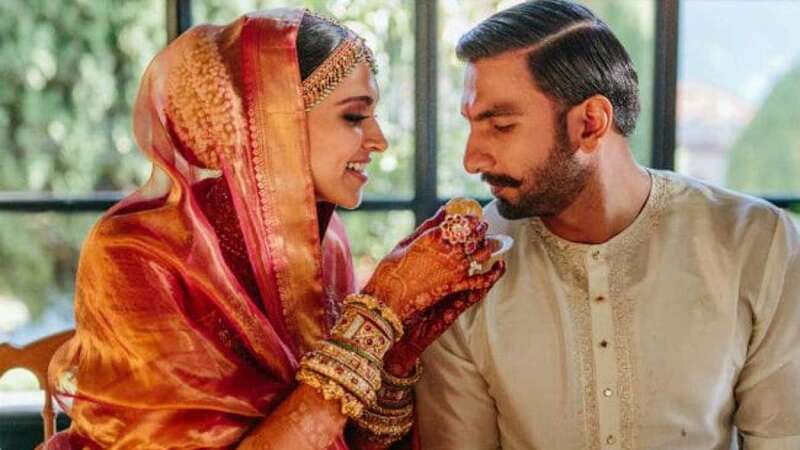 From haldi to mehendi and the wedding nuptials, Deepika and Ranveer, who kept their wedding images away from the public eye, finally took to social media on Tuesday to share some of their special moments with their fans. In several images the star couple, who are fondly called "DeepVeer" by fans, were seen enjoying joyful moments from the celebrations. Ranveer during the mehendi celebrations looked dapper in a light pink and red Angarkha paired beautifully with a maroon Bundi with Zardozi work. The "Piku" actress chose to colour coordinate with Ranveer and sported a light pink coloured lehenga with elaborate jewellery. Deepika looked resplendent on both wedding traditions Konkani and Anand Karaj. The couple's ensembles were rooted in tradition as they chose hues of reds, whites, pinks and gold as their primary colours. The two also shared a beautiful moment from one of their ceremonies, where Deepika can be seen offering sweets to Ranveer. The star couple tied the knot on November 14 and 15. The two are hosting their wedding reception in Bengaluru on Wednesday and in Mumbai on November 28.